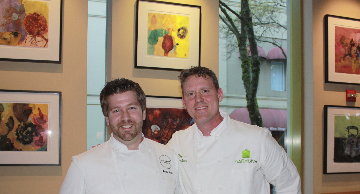 OK, so Dish of the Week was actually Bite of the Week ~ a Proustian breakfast moment Chef served to 300 Friday night at Pigs & Pinot, Charlie Palmer’s sold-out signature food event that takes over Healdsburg in mid-March. For those of you who grew up in the age of Top Chef ad infinitum and innumerable foodzines and foodblogs, it may be hard to believe that once upon a time the cult of the celebrity chef didn’t exist. Charlie Palmer didn’t invent the concept, but he was one of the first American chefs to draw crowds to his restaurant Aureole in NYC by sheer virtue of his talent alone. Back then (no, I wasn't going to say "in the good old days”) reputations could only be built by reviews and word of mouth. Palmer generated a great deal of both. In the years since he has built a mini-empire of restaurants and hotels that rivals Nobu’s in size if not influence. What Nobu is to black cod (basically on the back of one recipe), Charlie is to pork (significantly, the entire animal). I like Pigs & Pinot. It supports a number of worthy charities while functioning as it was primarily intended ~ a two day publicity venture for Palmer and Co. What I like best about it is the classy way it goes about making the connection between food and wine while strengthening a good swath of the local economy. Even as he burnishes his own brand, Palmer manages to advance a quality driven definition of the word sustainable in an age where even the best restaurants are struggling with the temptation to fudge standards in order to survive. 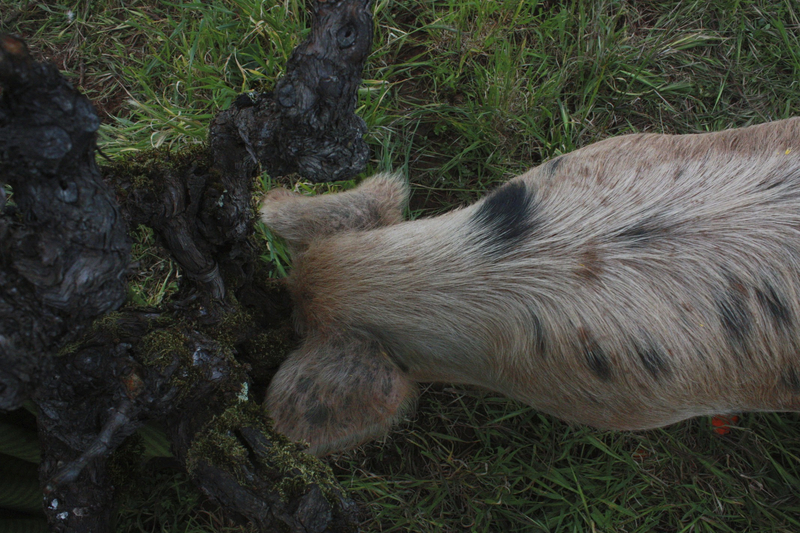 Any week of the year around here you can throw a stick and hit a food or wine event; few of them put the whole animal in focus to the extent Pigs & Pinot does. This is a message not lost on the 500 ticket holders that flooded the Hotel Healdsburg 1 & 2 this past weekend, with reportedly double that number on a wait list every year. 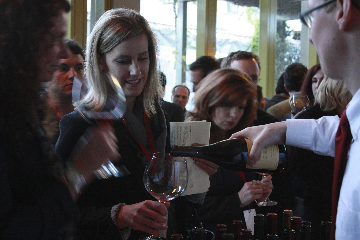 The remarkable world-class selection of Pinots guests get to taste are the sizzle, but make no mistake, the meat of this event ~ literally and figuratively ~ is the whole hog. 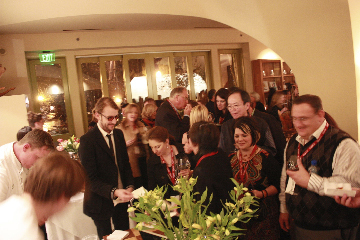 Most of the press Palmer generates focuses on Saturday, when “celebrity” Chefs from all over the country land in Healdsburg to flex their culinary muscle. But if you live here the real fun is watching the local talent go head to head on Friday night. Though every one of these participating local Chefs will tell you it's not a competition, that they are just ‘doing their thing,’ with few exceptions each secretly hopes theirs is the best pork mouthful of the night. And why shouldn’t they? Our Chefs are a remarkably convivial group, but the fun at these events is upping your game as you coolly hang out in the hood with guys you compete with on a daily basis. 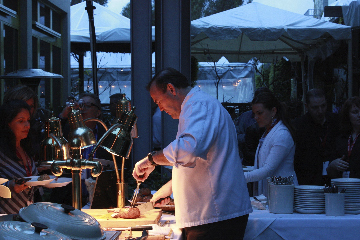 The fact that there is an abundance of talent to go with a healthy dose of competition is what makes Healdsburg a dining Mecca. That nobody cops to being competitive is just part of the charm of living in the country. In this respect Ryan is no exception, except to the extent that his competitive drive comes more from pride, than ego. He always defers when appreciative diners ask him to come out and meet them, and while he's forthcoming with the press he never goes in search of them either. Quite the contrary. Yet he’ll cook a dish over and over again to get it spot on, then think about it some more before Pancho and the team are put through their paces so it's served consistently the same way, every time, for each and every diner. As chuffed as he was when he won the Top Chef competition at Taste of Sonoma two years ago, he couldn’t wait to get out of there the minute it was over. I suspect that when (though no fault of his own) he couldn’t defend his title this year, his worry wasn’t what people would think when he didn’t show so much as missing an opportunity to go head to head again with another talented Sonoma County Chef. Americans have a funny relationship with what is, culturally, our inherently competitive nature. Because we always seem to equate success with money (or its corollary, fame) we are congenitally guilty of making the mistake that whoever has the most marbles when the bell rings has “won.” I’d go as far as to say that our obsession with money and fame ~ no matter how many ‘unhappy’ rich and famous people are paraded before us ~ borders on being a national illness. The mistake here, to my mind, isn’t so much that we haven’t learned money and fame can’t engender happiness (which deep down we probably know) it’s overrating the ephemeral entity of happiness in the first place. Between happiness and true satisfaction I'll take satisfaction any day of the week. Happiness is a beautiful vagrant, its perfume a scent in the air, music that lifts your heart, the touch of someone you love. All good, but for it even to exist it needs someone to blend the perfume, write the music, become the person you love. True accomplishment, whether building character or just a better mousetrap, is complex, and while luck can play a role it's not a sustaining ingredient the way a combination of passion and patience is. The satisfaction that comes from accomplishment ~ whether it brings you happiness or not ~ resides in the way something is made, how long you spend refining an idea, how many times you paint over a figure before its heart ~ of joy or darkness ~ appears. Until six years ago when I took on my latest career incarnation as “restaurateur,” I managed to fashion my life in such a way that whether I succeeded or failed (and I did a lot of both) it was always on my own terms. Even as my game changed over the years, from academia to photography and journalism, ultimately to design, I mostly avoided the world’s judgment in a way that allowed me to work on the quality of what I was producing without fear an audience of strangers wouldn’t like it. Many people don’t see a problem basing their success on something that’s been copied or stolen from its original source. Maybe that's why the world is filled with such derivative crap. But food doesn’t wait for that certain someone who understands your aesthetic to fall in love and take it home. What takes years to learn and untold hours to source and cook is consumed in the span of a few minutes. Wham, Bam, the verdict is in. In the past if someone did not like what I created I could console myself that it "just wasn’t to their taste”, or take the time to improve it. With food every dish and every meal must suit a diners taste each and every time…. because with food the customer is always right. That Ryan knows this and works at making our food ‘right’ for every customer, yet does so in a way where he is consistently challenging himself, pushing his own creative boundaries, is remarkable to me. As for who actually produced the best pork inspired dish last Friday, while I did not taste everything (an understatement considering how much incredible food was being offered) Dino Bugica’s (Diavolo) black sausage was about the best I’ve ever eaten. This man’s talent in all things charcuterie is a wonder. Ari Rosen (Scopa) had the most beautifully roasted whole baby pig which, in his inimitable style, he served simply. Cyrus’ Chinese bun was perfect respite just at the moment I was suffering from serious pork fatigue. I did not taste Charlie’s dish ~ his lines were moving at a snail’s pace ~ but the burnished pork bellies turning on the spit behind him in the central courtyard looked utterly mouth-watering. Very cool, right? But the most enjoyable moment of the night was still to come. As I stood watching I was approached by a couple from San Francisco who had returned to our station for “the final bite of the night.” I had never met them before and they had never eaten at Barndiva, though the woman ~ dark haired, very pretty ~ said she read the journal. They were extremely knowledgeable about food ~ off to Chicago in a few weeks “just to eat ” ~ but it wasn’t their erudition on all things culinary that struck me as the conversation moved swiftly from our favorite SF haunts through greatest meals ever, to a surprisingly honest appraisal of why eating out had come to comprise “some of the best moments” of their lives. Though they were obviously passionate about food, they weren’t precious about what they ate. While the room and the ambiance of a restaurant mattered, connecting with informed but not overbearing servers mattered a great deal more. Though they weren’t in the business they had, through their travels, begun to understand how hard good restaurants had to work to get it right, especially when it came to sourcing. They were, in short, critical but sympathetic. Standing there in the beautiful din of Charlie’s world the possibility suddenly occurred to me that along with the age of the celebrity chef we may be entering the age of the enlightened diner, people who see their patronage as team support, as crucial to the game as the crowds in a grandstand. 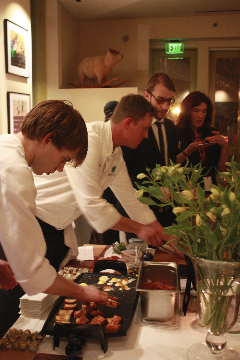 Dining out is a collaborative experience; diners should be honestly invested in its outcome. Because it's true, progressive diners ~ like the best fans ~ are the first ones to tell you when you make a bad play (or dish) but it's their cheers, when they come, that are the ones you most long to hear.